WiFi and Internet Are Not The Same Thing….. Okay, now what’s the difference? There is a massive difference between internet connection and wireless connection and the two are often confused as being the same thing. Internet = it is your connection to the world-wide web using a router or modem, generally supplied by your internet provider. We would always recommend having fibre where available as this will make this make most internet tasks faster so it is well worthwhile doing. Wireless connection = the speed/strength that your wireless devices such as iPad’s/phones etc connect to the router and therefore server (not the internet). Many things can affect this connection, the primary one is distance, the further you are away from the router the worst the signal. Wall/doors/electronic devices/radios/other wireless network/lead walls etc etc can all influence the quality of the signal between the router and the wireless devices. With wireless signature devices such as Clinipads, we have found that in a lot of cases unless the router is in the same room as the signature devices there are “speed” and disconnection issues, this isn’t an issue with the practices internet but with their WiFi as the signal isn’t strong enough to connect at a decent speed to the Router and therefore internal network. Any wireless device will have the same issues whether it’s a tablet / phone / WiFi Printer / Trios Scanner etc, they all rely on good WiFi to function well. Like anything getting your infrastructure is correct to ensure reliability. How can I resolve this? At many of the practices we support that use signature pads we have installed dedicated wireless access points to service their Wireless Devices, these create a WiFi network independent of the one from your router. Depending on the building multiple access points are used throughout the building to give a solid connection between WiFi Devices and the computer network using one single wireless name (SSID), as users roam around the building their devices hand off to the Access Point with the strongest signal. For example, if you want to enable WiFi access in your practice reception area but the router is in the cellar, an access point can be installed in the reception area, connected to your network and give a strong signal. 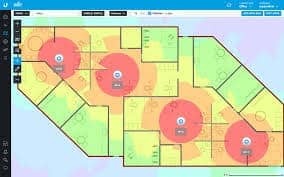 Access points such as UniFi can be fully managed by us online to see their status, number of devices connected to it, signal strength of those devices etc. If required installing multiple access points throughout the practice will allow full strong WiFi coverage of the practice. You can also use the same devices to give secure free WiFi to patients, branded and redirected to a webpage of your choice. Wireless Access points are the correct method for any dental practice or business wanting full and solid WiFi coverage. 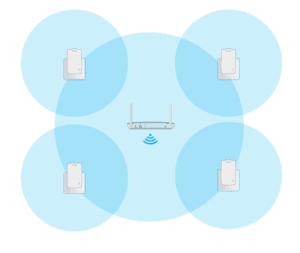 Diagram of how access points work, when correctly placed signals overlap so that full coverage is achieved, optimum placement requires network points in the correct location. Are there any other options? Some people use range extenders or “boosters”, what are Range Extenders? As its name implies, a range extender lengthens the reach of an existing WiFi network. Since range extenders connect wirelessly to WiFi routers, they must be placed where the WiFi router's signal is already strong, otherwise it will only relay a weak signal, they often have slightly different WiFi names as well which make roaming devices much more difficult and are very difficult to troubleshoot / manage. While range extenders can be great for home WiFi networks, they’re not efficient for businesses and we don’t recommend them. Diagram of how range extenders work, when correctly placed signals overlap so that better coverage is achieved, range extenders at best only relay a signal and so are subject to the usual interference's.. If you would like to talk to us about how we can resolve your WiFi issues please contact us via the normal methods or full contact details are below. Does your practice need a Dedicated Server?